The March add-on "Freshly Picked" from Polka Dot Whimsy included a mix of papers from Jillibean Soup and We R Memory Keepers. I instantly fell in love with the hearts on one of the Jillibean papers and knew I wanted to cut them out and line them up in a row. 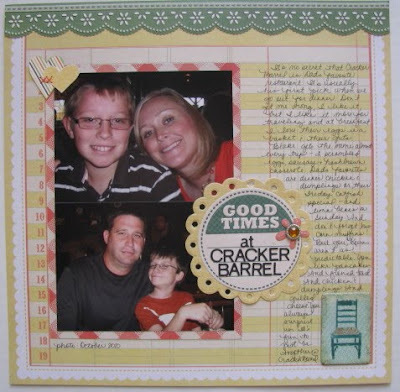 I had this photo of our family from a couple summer back that worked perfectly with this add-on kit. I remembered seeing fellow DT member Mel use fabric strips from a previous kit tied through a tag, so I copied that look here. I loved the simplicity of the heart sticker and my title on the kraft tag. And finally...my hearts. I even added a few stitches to finish them off. Oh look...more hearts and stitching. I have enough product from this kit to crank out another layout or two. There just aren't enough hours in the day... Right now we are on Spring Break from school and I am enjoying my time with my boys. I hope everyone has enough time in their day for some quality family time, too. Lovely work once again Amy! 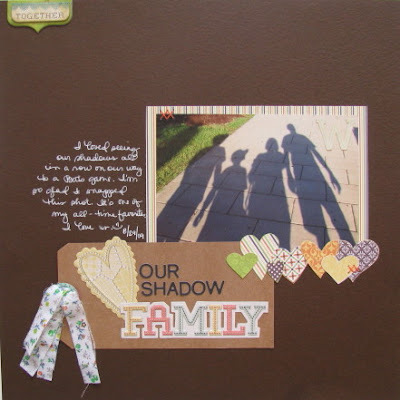 I LOVE LOVE LOVE your shadow family layout and picture, what a great idea for a layout! I know I've probably said this before, but I LOVE your handwriting!! Great LO's! My parents also love Cracker Barrel but we don't have any here. They are looking forward to being able to go there while visiting us in GA.
Great layouts! I LOVE the Shadow Family one!! !